Just like some other brands we have reviewed, Nature's Plus offers two different options of Garcinia Cambogia products. Our team did an extensive review on both of their products to see if they worked. Find out more below to see what they discovered. As mentioned above, Nature's Plus offers two different Garcinia Cambogia products. One of which they call Citrimax and the other they call Citrimate. They are essentially the same product, but one of them comes with added Chromium. That product is the Citrimate and it also comes with 90 pills instead of 60 like the Citrimax. We are not sure why that is the case because both bottles are priced roughly at around $22.00 depending on where you purchase the product and both have 1000 mg of Garcinia Cambogia at a 50% potency of hydroxycitric acid. We suspect the difference in pills may be a marketing ploy. At 22 dollars per bottle the Nature's Plus products are on the cheaper end of the Garcinia Cambogia cost spectrum. We believe this may be the case because of the low 50% potency of hydroxycitric acid (HCA). Our researchers firmly believe that in order to properly get results with Garcinia Cambogia products then they must contain an HCA potency of over 60%. Without this then the product may have much weaker results. The product also has received some decent reviews from people who have used it. Unfortunately, these reviews are a bit mixed. Some people have claimed that it is a great product while others firmly believe that it is a total waste of money. 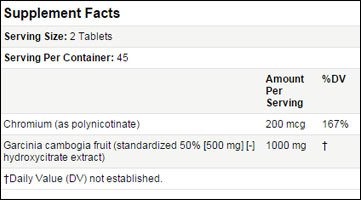 Again, we suspect the division of reviews is probably due to the low hydroxycitric acid concentration in both of the products offered by Nature's Plus. Return policies from this company also vary because they have separate retailers that sell the product for them. We would caution our readers to make sure that if they decide to purchase this product they need to make sure that they do so from a trusted retailer who has a good return policy. Some of our researchers thought that some of the retailers claiming to sell the product online looked very suspicious and potentially harmful. 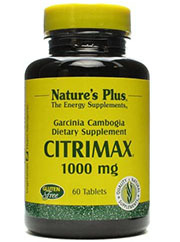 Nature's Plus Garcinia Cambogia main characteristics: 1000 mg, 50% HCA. Nature's Plus offers two products that are fairly cheap monetarily, but the product themselves are a bit cheap. They only offer an HCA concentration of 50%, whereas, our researchers recommend that Garcinia Cambogia products such have over 60% for sufficient results. The product also has mixed reviews and because it is offered from different retailers we encourage our readers to be diligent in picking a trusted retailer if they decide to buy this product. However, we do believe there are better ones for your time, money, and health. "I love Nature's Plus Garcinia Cambogia! I've been using it for a couple of weeks now and I plan to order more."